If you can’t be at Lansdowne Road this weekend, on the couch with us is the best seat in town. 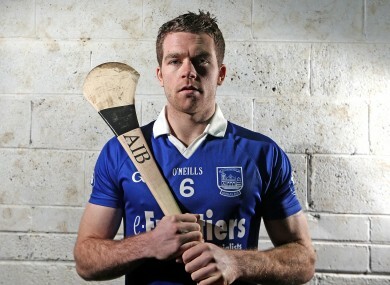 Thurles Sars man Padraic Maher has a busy weekend in store. One to watch: There’s a rugby game on Sunday in Dublin, right? One to Sky+: If you’re watching the Ireland v England match, don’t forget to tape Man U v Everton. Could be another 4-4. One to skip: Who has the time for skiing this weekend? Athletics: PSD Bank indoor meeting in Dusseldorf, Germany, (Eurosport, 6am). Basketball: NBA, Miami Heat v Los Angeles Clippers, (ESPN, Saturday 1am). Cricket: ODI, Australia v West Indies, (Sky Sports 2, 3am); Women’s Cricket World Cup Super Sixes, TBC, (Sky Sports 1, 6am). Football: npower Championship, Watford v Crystal Palace, (Sky Sports 1, 7.30pm). Rugby: Six Nations U-20s, Ireland v England, (RTÉ Two, 7.30pm); Aviva Premiership, Sale Sharks v Exeter Chiefs, (ESPN, 7.15pm); RaboDirect Pro12, Ulster v Ospreys, (BBC2, 7pm). Skiing: World Championships in Schladming, (Eurosport from 8.45am). Tennis: ATP Tour, Open Sud de France, (ESPN, 2pm). Boxing: Fight Night, Kiko Martinez v Carl Frampton, (Sky Sports 1, 8pm). Cricket: Twenty20, New Zealand v England, (Sky Sports 1, 5.30am); Women’s Cricket World Cup Super Sixes, TBC, (Sky Sports 2, 3.25am). Football: Premier League, Tottenham v Newcastle, (Sky Sports 2, noon); Sunderland v Arsenal, (Setanta Sports Ireland, 2.30pm); Southampton v Manchester City, (ESPN, 4.30pm); Premier Soccer Saturday, (RTÉ Two, 8pm); npower Championship, Brighton v Hull City, (Sky Sports 2, 5pm); Clydesdale Bank Premier League, Inverness v Celtic, (ESPN, 11.15am); Primera Division, Levante v Malaga, (Sky Sports 4, 6.55pm); Real Madrid v Sevilla, (Sky Sports 4, 9pm); African Nations Cup third-placed play-off, TBC, (ITV4, 5.30pm and Eurosport 5.45pm). GAA: Allianz FL Division 1: Cork v Kildare, (Setanta Sports 1, 7pm); Donegal v Down, (Setanta Ireland, 7pm). All-Ireland Club SHC semi-finals: Thurles Sarsfields v Kilcormac-Killoughey; St Thomas v Loughgiel Shamrocks (TG4 from 1.30pm). Golf: European Tour, Joburg Open, (Sky Sports 3, 10.30am); PGA Tour, Pebble Beach Pro-Am, (Sky Sports 3, 6pm). Horse racing: Leopardstown, (RTÉ One, 2.05pm); Channel 4 Racing, (Channel 4, 1.30pm). Rugby: RBS 6 Nations, Scotland v Italy; France v Wales, (RTÉ Two, BBC1 from 2pm); Aviva Premiership, Northampton Saints v Gloucester, (Sky Sports 1, noon); Harlequins v Wasps, (ESPN, 7.45pm). Skiing: World Championships in Schladming, (Eurosport, 9.45am). Basketball: NBA, New York Knicks v Los Angeles Clippers, (Sky Sports 2, 6pm); Miami Heat v Los Angeles Lakers, (Sky Sports 2, 8.30pm). Rugby: RBS 6 Nations, Ireland v England, (RTÉ Two, 2.15pm, BBC1, 2.25pm); IRB Rugby Sevens, (Sky Sports 4, 3pm).